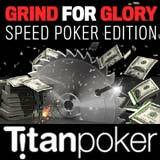 Win cash, bonuses and tournament tokens in the Grind for Glory Titan Poker promotion running from 8th - 31st July. 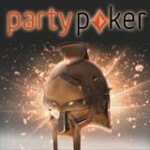 Players are required to earn points playing Speed Poker, Titan Pokers fast fold poker game. Earn at least 10 poker points to win the first level prize, with up to $200 in cash and bonuses to be won. 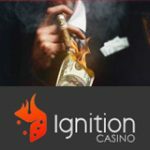 New players can get their piece of the action by signing up with a 200% first deposit bonus up to a maximum of $2,000. 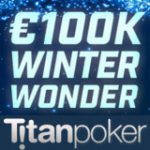 Depositing players will also receive their Titan Poker Welcome Package when depositing at least $20. Get a cash and bonus up to $200 in the Grind for Glory promotion on TitanPoker, play Speed Poker and complete your target points and active day requirements to win one of ten different prize levels. 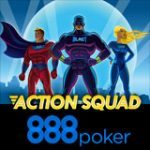 Sign-up for a free poker account. Opt-in for the Grind for Glory promotion and play Speed Poker games. Players are required to earn a minimum of 1 poker point for 10 days of the promotion to claim the first level prize, each level has a point requirement as well as the amount of days the player must participate in the Grind for Glory promo. 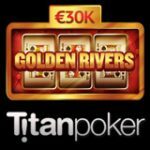 Grind your way up the levels to get the biggest reward which includes: instant cash, pending bonuses and tournament tickets to the $1,000 Titan Poker Freerolls. Players can only earn one prize based on their level achieved in the Grind for Glory promotion, cash prizes are paid into players accounts at the end of the promotion. Bonuses are issued with 72 hours of the completion of the promotion, players are required to clear their pending bonuses within the same amount of days they played during the Grind for Glory promotion dates 8th - 31st July. 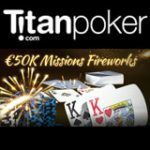 Release the pending bonus by play any real money poker games on TitanPoker in August.